Ranunculus are wonderful plans, flowering in early spring, and with great foliage from autumn to early summer. 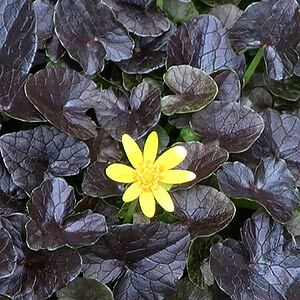 One of the best is Ranunculus ficaria ‘Brazen Hussy’, a valuable ground cover for part shade. It is a tough plant, as it is dormant from when the weather warms up in summer, right through until autumn, so no real watering required during these dry months. You may have heard of ‘Lesser Celandine’ and this is a form of that plant. If you have position with summer shade, with some moisture, it is easy to grow and rewarding. The flowers are a buttery yellow, the foliage a deep purple to green bronze, that acts as a great foil for the flowers. This is a mound forming or clump forming plant. It works well in a number of garden situations especially as a filler between plants such as Hostas and even Epimediums, where it adds colour at times of the year that they do not. Over time ‘Brazen Hussy’ will spread to form a neat clump, easily divided in late summer while it is still dormant. Although it will spread, the habit is neat and it is not invasive. Basic care is simple. Fertilise in autumn with almost ant all purpose fertiliser. some blood and bone and some seaweed fertiliser works well. Water in spring if the weather is dry. Ranunculus ficaria ‘Brazen Hussy’ will reach around 5 cm in height and form a clump to around 50 cm over time. Ranunculus ficaria ‘Brazen Hussy’ is available for sale from the following nurseries.